President Woodrow Wilson, final bronze portrait, half life size, F. W. Allen, sculptor, 1940. 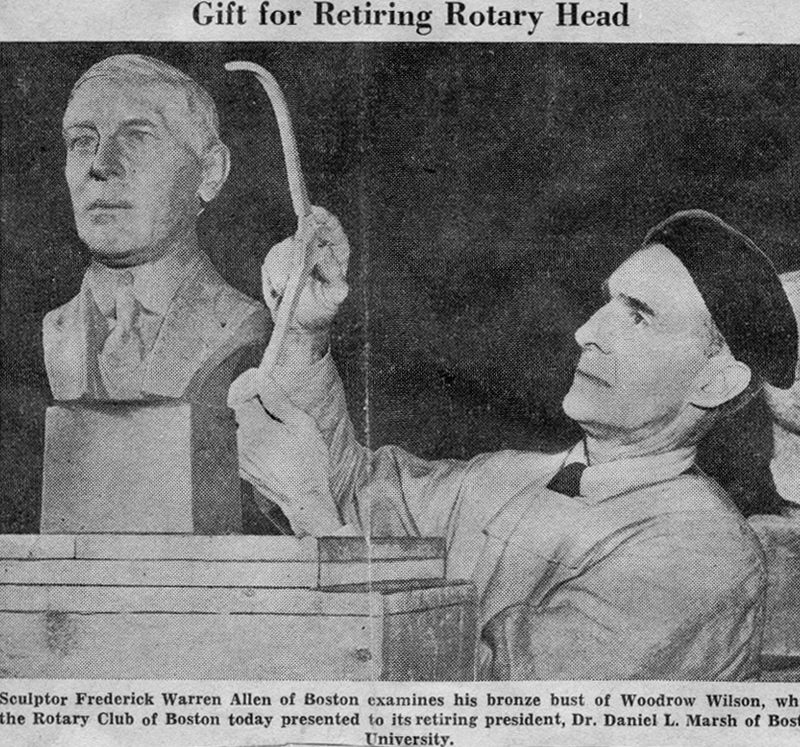 The portrait bust of Woodrow Wilson for the Rotary Club was “pronounced a remarkable likeness of the late President at the height of his powers.” The Hub (the official publication of the Rotary Club of Boston, MA) 1940 The article shows the bust in bronze, evidenced by the dark color and shiny surface of the metal. 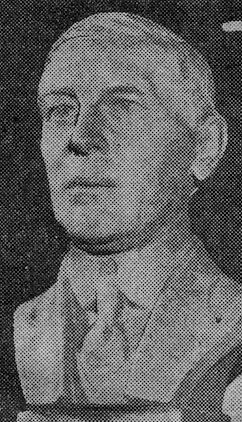 The Boston Evening Transcript, April 24, 1940 noted additionally that it was an original half-life size bronze portrait and one of the few existing busts ever made of Wilson. The writer also noted it is the only copy to be made and that it is the only one of this size in the East. President Woodrow Wilson, commissioned by the Rotary Club for retiring president Daniel L. Marsh. Portrait bust in clay. 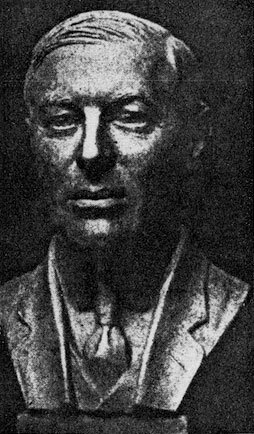 Sculptor Frederick Warren Allen, 1940. Looking at the bust, one sees the familiar face with neatly combed hair, large eyes, flat-bridged nose and full lips. The style is formal and classical with a narrow yoke showing the collar and tie, the V of the vest and the lapels of the jacket, placing it in 20th Century style. The shoulders are cut away to a narrower base, which is integrated into a square block over which the undercut portion of the lapels protrude. It’s a clear, modern and masculine treatment of the bust format. Wilson was elected to the office of President when Allen was in Paris in 1913 just before the war. The beginning of his career was in a time of Wilson’s progressive legislative policies which was good for business and therefore good for art. He was re-elected in 1916. America declared war in April 1917, just a month before the death of Bela Pratt and the “tragic rift” in the staff of the Museum School. The First Red Scare of 1919-20 continued to affect Allen in a subconscious way through the 1930s when non-American teachers began to infiltrate the very Bostonian school teaching staff. The attitude toward women changed also with Wilson’s endorsement of the Nineteenth Amendment, so women began to be taken more seriously as artists. The War ended under his watch and he was awarded the Nobel Peace Prize for sponsoring the League of Nations, one of only three Presidents to be so honored. 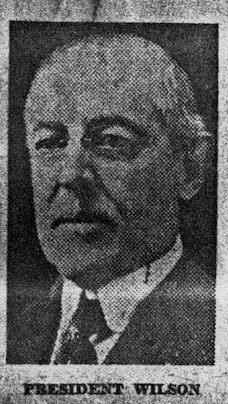 Wilson served as President until 1921 establishing a time of peace and prosperity compared to the coming years of economic depression and a second war. The twenties were good years for Fred Allen, so creating a fine portrait of the President who influenced the beginning of his career in a positive way was a fitting tribute.